Visitors and club members check out one of the new game rooms at the Boys & Girls Club of San Juan that had its official opening on Wednesday in San Juan. SAN JUAN — Children here will finally have their very own Boys & Girls Club facility, Hidalgo County Precinct 2 Commissioner Eddie Cantu said Wednesday. 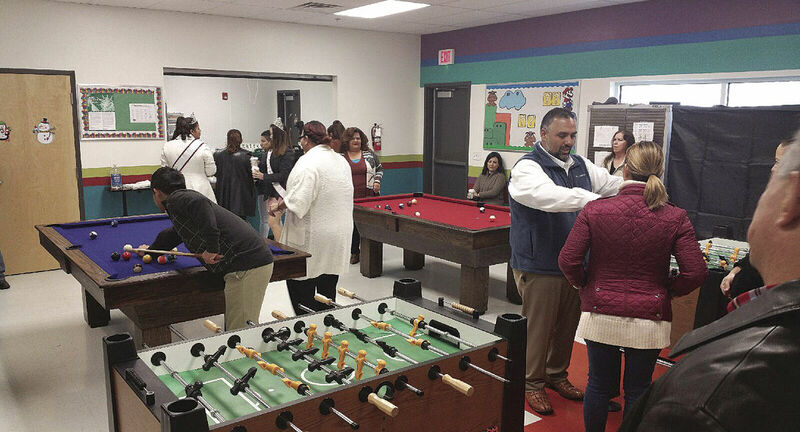 Cantu, who championed the effort, partnered with the Urban County program, the city of San Juan, and the Boys & Girls Club of neighboring Pharr to bring direct services to families in San Juan. “San Juan has never had a brand-new, stand-alone (facility),” Cantu said after a ribbon-cutting ceremony Wednesday afternoon. Instead, families in San Juan had to enroll their children in the Boys & Girls Clubs of neighboring communities. Such was the case earlier this year, with families being referred to the Boys & Girls Club of Alamo for services. San Juan Mayor Mario Garza, who also spoke at the event, said he first heard about the need for youth services on the north side of town while campaigning a few years ago. The 5,925-square-foot facility is located at 509 Earling Road and includes two learning centers, an arts-and-crafts room, two game rooms, a technology center and a full kitchen and cafeteria. The building, alone, cost about $750,000, Cantu said, and 100 percent of that money came from Cantu’s office, which initially received the funds through its share of Urban County monies. But construction wasn’t the only cost to be dealt with. The equipment inside the game rooms was courtesy of a $30,000 donation made by members of the Pharr Sunrise Breakfast Kiwanis Club. Operational costs, which are estimated to be around $75,000 per year, will be paid by the city of San Juan and Urban County. Meanwhile, administrative costs will be covered by the Boys & Girls of Pharr, which will oversee the program, said Alfredo “Freddy” Mata Jr., CEO for the Boys & Girls Club of Pharr and San Juan. The Pharr club has already been working toward the new facility, Mata said. “Every grant we wrote for the Boys & Girls Club in Pharr, we included San Juan,” he said. “Before we knew it, slowly, we were able to raise $100,000 in funds (before its doors even opened). Mata, who gave an impassioned speech, took the opportunity to ask attendees — many of whom were elected officials and high-profile figures — to continue to support the nonprofit by volunteering, serving on a committee or raising funds. Mata stressed the facility is meant for all children, regardless of economic circumstances. The new club opened its doors in November and is already at 75 percent capacity — without even being advertised, Mata said. The 2017 program is currently free of charge, but once the new year begins, families will pay $30 for year-round services. “We’re going to quickly reach out limit and our capacity,” he said about the 150 slots up for grabs.